Born: 28th November 1896, Ipswich. Baptised: 28th November 1897, Ipswich. Parents: William Robert & Laura Lavinia Collis. 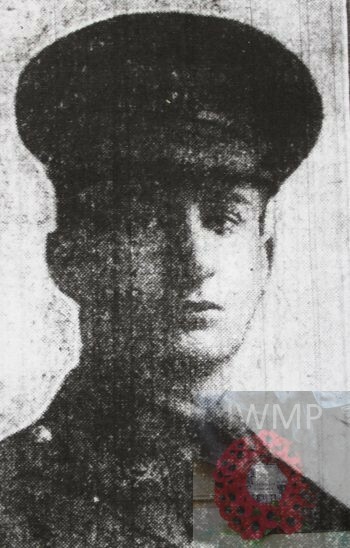 Died: 20th December 1915; age 19; Died of Wounds – shrapnel in the chest following the bursting of a shell on the 19th December – died the following morning at No.10 Casualty Clearing Station. Occupation: Bertram was studying to be an Optician when war broke out. Enlistment Date: 1st September 1914. He immediately applied for a Commission; but finding that there was likely to be some delay in obtaining this he joined the Loyal Suffolk Hussars, as a Trooper. Accident: Three weeks after joining he was thrown from his horse and broke his collarbone. Commissioned: On the 17th February 1915, he was gazetted Second Lieutenant in the 3rd Battalion, Suffolk Regiment, Special Reserve. Bertram proved himself a capable instructor, he was selected, with three others, to train a Regiment of Cavalry in Infantry Drill. Date of Entry Therein: 30th September 1915 -France and was attached to the 9th Battalion, Suffolk Regiment. On Sunday morning, 19th December, Bertram was in charge of his platoon at a barricade across the road, during a bombardment he was struck in the thigh by shrapnel. He retired to a Dressing Station, after the wound was dressed, and making light of his wound, he speedily returned to his position, and to rejoin his men. Almost immediately he was struck again by a bursting shell. In spite of every attention he died the following morning in hospital. Ipswich School magazine – March 1916. Regiment: Suffolk Regiment, 3rd Battalion, attached 9th (Service) Battalion. Bertram’s Major had told him just before he was taken to the Dressing Station, that he had been recommended for a decoration – Bertram had smiled and seemed pleased. Relatives Notified & Address: Son of William & Laura Collis, of Heath Lodge, Nacton Road, Ipswich. 1901 St. Andrew’s Street, Bury St. Edmunds, Suffolk. Bertram was 4 years old and living with his brother at the home of their aunt, uncle & cousin. Edward Samuel Smith, 39, a House Furnisher – employer, born Bury St. Edmunds. Annie Rosina Smith (nee Cooke), 32, born Southwark, Nottinghamshire. Olive Gwendoline Smith, 12, born Bury St. Edmunds. Leslie Wilfred Collis, 7, born Ipswich. 1911 Heath Lodge, Nacton Road, Ipswich. Bertram was 14 years old he was living with his parents & brother. William Robert Collis, 46, a Goldsmith & Jeweller – Shopkeeper – employer, born Bury St. Edmunds. Laura Lavina Collis (nee Cooke), 40, born Peterborough, Northamptonshire. Leslie, 17, a Medical Student. Bertram attended Ipswich School – entered 1909. He was a member of the School O.T.C. Bertram’s medals were sent to his mother, Mrs L.L. Collis, at ‘Heath Lodge’, Nacton Road, Ipswich. Bertram is also remembered on the Chapel war memorial at Ipswich School. Holy Trinity church Ipswich.